The Great Rhythm And Blues Festival – Get Your Tickets! Tickets are on sale for The Great Rhythm And Blues Festival in Colne – 26-29 August. Wilko and the boys will be rocking the fest on 28th. 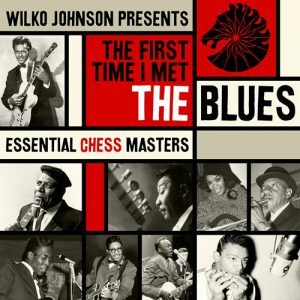 Some top notch reviews are rolling in for Wilko’s Chess compilation as part of Universal’s ‘The First Time I Met The Blues’ series. Including these, from MOJO and Record Collector! Grab your top-tapping copy of the compilation here. 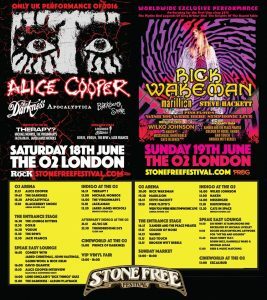 Wilko and the boys are pleased to be appearing at the upcoming Stone Free Festival on June 19th at The O2! For further information, please click here. Plus Wilko Johnson will be appearing as Richard Hawley’s special guest on July 22nd at the Iveagh Gardens, Dublin! What a wonderful evening we had at Rough Trade East for the launch of ‘Don’t You Leave Me Here’ (Little, Brown) last week. Here are two great write-ups of the night, one courtesy of RockShot and the other on Every Record Tells A Story. We are assured all promotional materials featuring his image are being retracted in order to avoid any further confusion. ‘Wilko Johnson Presents: The First Time I Met The Blues – Essential Chess Masters’ is Wilko’s selection of his top blues picks – and it’s out TODAY! Here’s a review of the collection by the esteemed Richard Williams on The Blue Moment. Snap up your copy here! The Guardian will be hosting a web chat with Wilko on Tuesday May 31st from 12.30pm, so if you have a burning question for the big man, now’s your moment! Click here for further information. Wilko has been busy on the airwaves promoting his new book, ‘Don’t You Leave Me Here’, which is out TODAY! Don’t miss him on BBC Radio Scotland speaking to the fab Janice Forsyth this afternoon (May 26th, from 2pm) and on BBC Radio 4 / Front Row tonight! 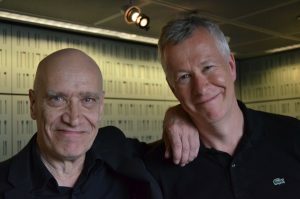 Here’s a lovely picture of Wilko with Front Row’s John Wilson, courtesy of Mr Wilson’s Twitter page. Wilko’s new book ‘Don’t You Leave Me Here’ (Little, Brown) will be launched next week! Here are a couple of lovely reviews to whet your appetites, courtesy of The Spectator’s Leyla Sanai and Marcus Berkmann at the Daily Mail. You can also hear Wilko talking about his book with Robert Elms on BBC London here, about staying in Europe on The World Tonight here, and don’t miss him on Steve Wright In The Afternoon on BBC Radio 2 on Wednesday 25th May! Don’t forget Wilko Johnson and the boys will be in Ballyshannon for the Rory Gallagher Festival! The festival itself takes place between 2-5 June and Wilko hits the stage on Saturday 4th at the Big Top. 2nd June – Rough Trade London – launch in conversation event with Zoë Howe.